Two Sundays ago my grandma took my dad to the Mets game in Philadelphia. It had been his birthday present, booked months in advance, and by the time the day arrived even I was looking forward to them going (the hype was out of control). I was a little worried the outcome would be depressing, one in which the Mets sad, sad batting average with RISP might keep them from closing the deal. But the worry was all for naught. Upon their return I received from my grandma the world’s most detailed recap, including a breakdown of food stands closest to their seats, a review of Philly’s sno-cones, reenactment of best moves by the Phanatic, how exactly de Grom’s hair looked like my dad’s did in the 70’s, concern about where that “cute little Nimmo” might have gone, and outrage that one couldn’t find decent Mets’ paraphernalia for purchase anywhere in Citizens Bank Park. 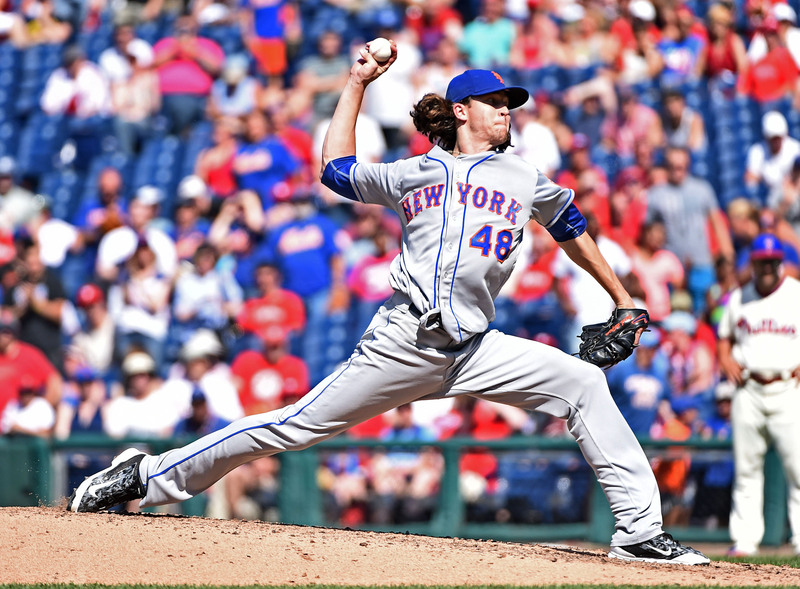 Oh, and also Jacob deGrom had pitched a one-hitter. deGrom performed so well that neither the Mets’ bats nor Familia had room to muck it up—deGrom threw a shutout in his first complete game, giving up a single hit to the opposing pitcher Zach Eflin, a moment I found equal parts infuriating and another point in my tally box for arguments against the DH. Now more than four years out from Johan Santana’s streak-ending no-hitter, deGrom’s performance fits right into the Mets’ previously held tradition of being oh-so-close. While the Phillies actually hold the longest streak for not throwing a no-hitter—8,945 games over 58 years from 1906-1964—the new era of pitching in more recent years does make the Mets’ 8,019 games and 50-plus years without a no-hitter (from the team’s inception to 2012) feel like something special. And statistically, it is: a fascinating bit of Baseball Prospectus history, the site published Craig Glaser’s in-depth look at the mathematical likelihood of the Mets managing to avoid a no hitter as long as they did just three days before Johan Santana broke the streak on June 1, 2012 (in the 8,020th game). At the time of Craig’s analysis, the Mets had played 8,008 games, making the probability that a team could have played that many games and that none of them would’ve been a no-hitter just 0.67 percent, and the probability that the Mets themselves could have done it just 0.32 percent. The latter number is to me particularly intriguing because, if you were rounding to the nearest whole percentage point, it’d be zero—meaning that from 1962-2012, the Mets had achieved the impossible. The 0.32 percent also speaks to an historically very talented pitching staff. Nine Mets pitchers threw no-hitters before becoming Mets—Warren Spahn threw two. And, though technically not recognized as a no-hitter by the MLB, Pedro Martinez threw nine innings of a perfect game as an Expo in 1995 before giving up a double in the 10th. Seven pitchers also went on to pitch no-hitters after their time with the Mets—Nolan Ryan threw seven alone (! ), and Hideo Nomo threw two. And then, the streak was broken. Le sigh. I’m not going to argue that to break the streak was a shame because it was a bit of bonding material for us fans, exactly, though a part of me can’t help but ascribe to this brand of Mets masochism; I feel a perverse pride, for example, that no one is likely to touch that 1962 40-120 record, a bit of baseball history for us to claim wholly. Really, though, I just wish the no-hitter to have broken the streak was actually, like, a good one. For one thing, the foul ball Carlos Beltrán hit down the third base line in the sixth was to my eyes pretty clearly fair, though I suppose that is just the way of the game pre-video review, and many no-hitters were likely subject to similar bouts of luck (or injustices). But that Santana also threw the infamous 137 pitches despite his count limit and walked five batters doesn’t exactly scream history-making pitching perfection. In fact, a lot of Mets pitchers have had better games. Notably, the Mets have had 38 one-hitters over the years, including one by Jonothon Niese in 2010 against the Padres and three by R.A. Dickey. (Two of these were rain-shortened games, and a few were joint efforts by multiple pitchers, but they are technically recognized by the MLB as Mets one-hitters.) Two of Dickey’s one-hitters came days after Santana broke the streak, on June 13 and June 18, 2012. Matt Harvey and Bobby Parnell together took a one-hitter into the 10th against the White Sox in 2013. And deGrom’s shutout of the Phillies on July 17 was the latest in impressive close-but-no-cigar performances. Yet even as pitchers today are throwing harder than ever, with their value in the eyes of management having increased in Queens and across the sport, the post-Santana Mets seem to have gone straight back to carrying the torch of an exceptional starting rotation and zero no-hitters. Some of this has to do with luck and some has to do with the fielding that backs up those pitchers, but even still I can’t help but wonder whether the Mets are be headed toward another streak of improbable pitching despite their cadre of stars. Meanwhile, the Padres are about to cross the 8,000 games sans-no-hitter streak, lasting from the team’s inception in 1969 to today. It seems unlikely that they’ll break through before reaching 8,019, but I suppose it always does. Sorry Padres fans—my heart of hearts holds a secret wish that you hold out until 8,946, if only to steal a record from those pesky Phillies.